Is this the foldable phone that's going to change it all next year? 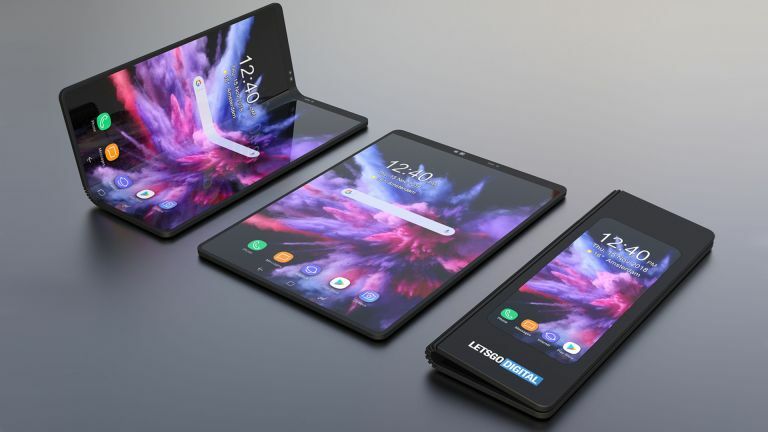 The Samsung Galaxy F foldable phone, aka Galaxy X, has appeared in new images that show what the bending future of phones could look like, complete with fold-friendly Android Q onboard. The new render images of the potential Samsung Galaxy F come from Letsgodigital which mocked up the glimpses into one possible future. As you can see the image shows off the phone folded out flat in tablet format, half closed and totally closed with that front-facing screen on display. Samsung has already revealed its main screen for this phone called the Infinity Flex Display. This was officially shown off at the Samsung Developer Conference, albeit in a darkened light that was tough to see. This new render brings that screen into a much clearer light. The main display is expected to be a 7.3-inch OLED that folds in on itself. When closed there will be a 4.5-inch OLED on the outer side of the phone that allows it to be used as a smartphone in one hand. At the same Samsung event Google's new Android OS was mentioned and we got a glimpse of what flip phone support could offer. One nice feature showed three windows open side by side on the folded out screen. A video was then played fullscreen on the large folded out screen then, when folded, it continued to play on the smaller screen. The Samsung Galaxy F is expected to arrive early in 2019 with a very steep price tag of over £1,000, at least.